In today’s business world, big data dominates the market in almost every niche. It offers companies of all sizes the opportunity to capitalize on accurate consumer data they have endeavored to gather, in the hope of increasing sales and revenue. Once the data has been obtained, it is crucial a business has an automated system in place, which will allow them to efficiently convert this data into useful insights. An analytical data mart is the most efficient way for an organization of any size to create readily available data, which is easy to find—thus increasing a company’s productivity. What Exactly Is a Data Mart and Why Is It Important? A data mart is basically a subject-orientated database usually made up of a separate segment inside a data lake, which is relevant to a particular focus of a business such as marketing or risk management. The reason why so many companies are now implementing data marts is due to the fact business processes are vastly accelerated—information that could take months to pull out of a data warehouse can be accessed in a matter of days. Allowing actionable insights to be found more quickly. Dependent. A dependent data mart is created as a result of directly drawing data from either operational or external sources and sometimes both. Independent. An independent data mart does not rely on, or require, a central data warehouse. Hybrid. Hybrid data marts draw information and data from either the data warehouse or the operational systems in place. If you have a smaller organization with fewer employees, then an Independent data mart or cloud-based data lake could be an excellent option, as you don’t need a data lake or warehouse in place to reap the benefits. However, if your business is large and you need to be able to pull data from multiple databases with fast turnaround times, then a hybrid data mart is perfect for your needs in terms of data sources. 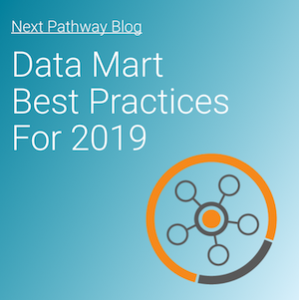 If you have decided your business could benefit from having a data mart in place, then here are some important tips to consider the best practices for 2019 when you go about implementing your data mart. In order for your data mart to operate as efficiently as possible, you need to take the time to ensure the source of analytical data is accurately structured by department. With data warehousing or “data-marting,” you should set yourself a time frame for the various parts of the implementation cycle. These time frames should be weeks as opposed to months if you have a sound data supply chain established. This will help you to hold yourself accountable for working on getting your data mart up and running as soon as possible. Ensure all the necessary people are involved in the designing and planning stages of your data mart implementation, in order to simplify the implementation process of your data mart as much as possible. In order to ensure your data mart operates seamlessly, you should factor in the cost of any hardware or software you might need as part of the data model, as well as keeping networking and implementation costs in the forefront of your mind when it comes to creating a budget for the data mart, as well as the amount of data stored. It is always a good idea to remember a data mart might not necessarily be located within your data warehouse. This is why you should ensure there is enough network capacity to be able to handle large data volumes are necessary to transfer relevant data across to the data mart. When it comes to planning your data mart, don’t forget to include the time it will take for the loading process to complete. You will need to factor this into your implementation costs, as the loading time will increase with the complexity of transformations. A data mart is more of a cost-effective solution to data management than a data warehouse and it can also be more efficient. Your business productivity will increase, thanks to the fact data marts are designed specifically for your users’ needs. Frustration among employees is always a key player in a business not living up to its full potential, so investing in automated processes is going to benefit the growth of your business in the long term. Business leaders often become overwhelmed when they consider the lengthy implementation time and costly expense of developing an entire data warehouse, which is where a data mart becomes incredibly useful—it is cheaper, faster and quicker to set up. It is a smart solution for progressive organizations of all sizes in 2019.